JULY 1916 was a bad World War One month for Helensburgh, with two well-known young officers losing their lives in very different ways. Royal Flying Corps pilot Lieutenant George Maxwell Vereker Bidie died in a flying accident at Whitstable, Kent, on July 8, and seven days later 2nd Lieutenant Alfred Anthony Douglas Raeburn (right) of the 9th Highland Light Infantry Glasgow Highlanders was killed in action at the Battle of the Somme. Lieutenant Bidie was on his way back to France, while Second Lieutenant Raeburn — son of shipowner William Raeburn, later Sir William — had been at the front for six months. Official records show that the 24 year-old pilot was flying a British single-engine tractor two-seat biplane, B.E.2d 5793, designed by Geoffrey de Havilland and developed by the Royal Aircraft Factory (as pictured below). He took off from the Southern Aircraft Depot at Farnborough, and sideslipped on a low turn and nose-dived into the ground near Whitstable. He and Air Mechanic 2 William Charles Manning (25) were killed. News of the death of the former Royal Scots officer reached Helensburgh quickly. He was a son of the only daughter of Mrs Gillatt, of Broomknowe, Rhu. His parents were Colonel and Mrs Bidie, who lived in Bangalore, India. The previous year he married Marea Bradbury of Strathyre, Busby, a niece of Mr and Mrs Hoggan, of Ardenvohr, Rhu — now the Royal Northern and Clyde Yacht Club. His funeral took place to Helensburgh Cemetery, and was attended by a number of officers and friends as well as by relatives. The service was conducted in St Michael and All Angels Church by the Rev Dean Hutchison from Glasgow and the Rev J.Smith from Clydebank, in the absence of the rector, the Rev C.B.Beard, who was on holiday. Two pipers and two buglers from the Royal Scots took part. During the service a plane circled overhead until the end of the funeral. Floral wreaths were sent by his parents in India and by the Royal Flying Corps and the Royal Scots, while the flowers from his wife were in the design of an aircraft. Lieutenant Bidie spent his childhood on Garelochside with his grandmother, Mrs Gillatt. He was a popular pupil at Helensburgh’s Larchfield School, and later at Carysfield and Cheltenham. After leaving school he attended the Royal Military Academy at Sandhurst, then joined the 1stBattalion Royal Scots in India. He returned home at the start of the war, and went with his battalion to France, where he was wounded twice. Later he joined the Royal Flying Corps, and on gaining his wings he became an instructor at the Stirling Aerodrome. His links with Alfred Raeburn were St Michael’s Church and Larchfield School, and they must have known each other. There are memorial tablets to both in the church. 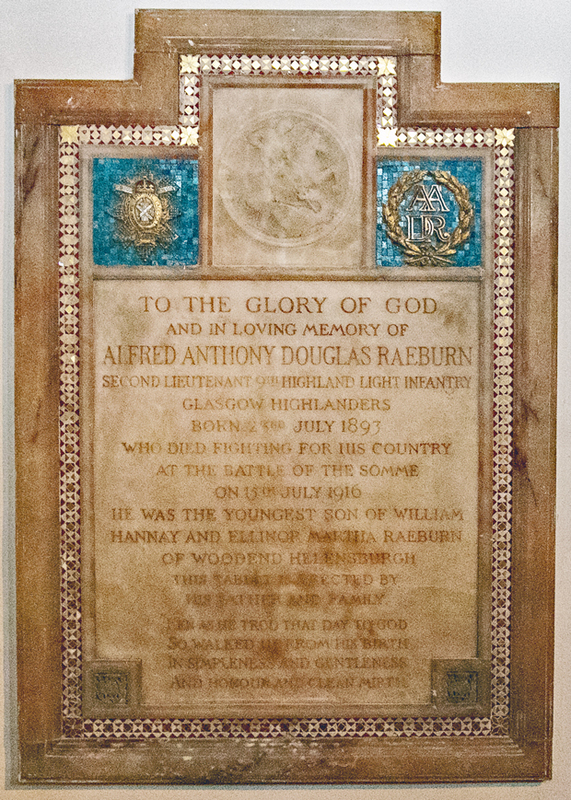 Second Lieutenant Raeburn was one of so many who lost their lives in the Battle of the Somme. His death on July 15 was eight days before his 24th birthday. After Larchfield he went to Glenalmond College where he was a Lance Corporal in the Officers Training Corps. A pitch at the college is named after him. An enthusiastic football player, angler and cricketer, he was a member of Helensburgh Cricket Club. After completing a full practical course in shipbuilding and engineering, he entered his father’s business, and it was believed that a brilliant career lay in front of him. He was commissioned in the Glasgow Highlanders, part of the Highland Light Infantry, in February 1914, and went to France six months before his death in action. He is remembered on both the Sir Edward Lutyens-designed Thiepval Memorial to the 72,336 ‘missing’ of the Somme who have no known grave, and the Helensburgh Cenotaph. The plaque on the north wall of the burgh episcopal church was placed there by his father and his wife, Ellinor Martha, of Woodend, Millig Street, in memory of their youngest son. Sir William, the 1st Baronet of Helensburgh, MP for Dunbartonshire from 1918-23, and a Justice of the Peace, was a member of the Vestry of St Michael’s and a key figure in the erection of the church tower and provision of new bells in 1930. His first son, William Norman Raeburn, born in 1877, spent his early years at the family home and was also a member of Helensburgh Cricket Club, as well as being a chorister at St Michael's Church. He was educated at Kelvinside Academy and Uppingham, then graduated M.A., LL.B from Glasgow University. He was called to the Bar by the Middle Temple in 1903, and took silk in 1909. He specialised in arbitration. He became the 2nd Baronet in 1934, and died in 1947, when he was survived by his son Edward Alfred Raeburn, who became the 3rd Baronet, and two daughters.